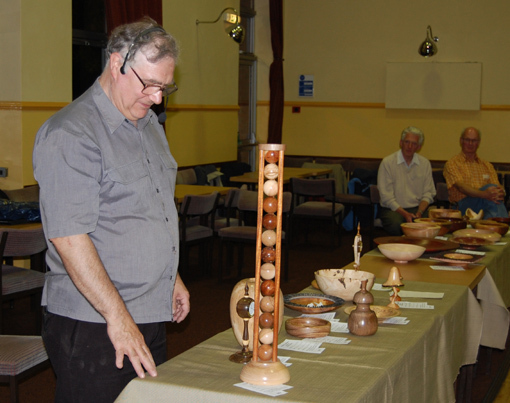 This was a welcome return for Paul whose main demo tonight was his self re-winding spinning top. 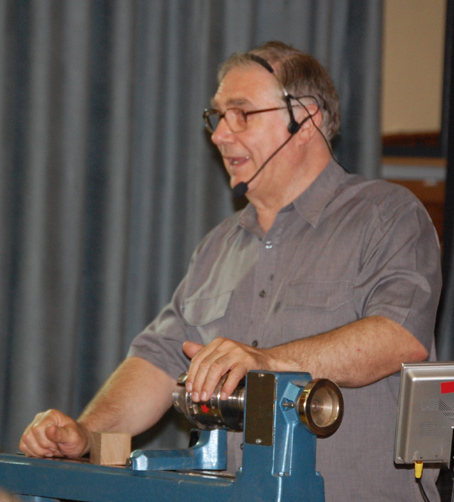 Before starting, Paul explained that he is a great believer in safety in the workshop and usually uses dust extractors and hoods, safety glasses and steel cap shoes but some things have to go for a demo. 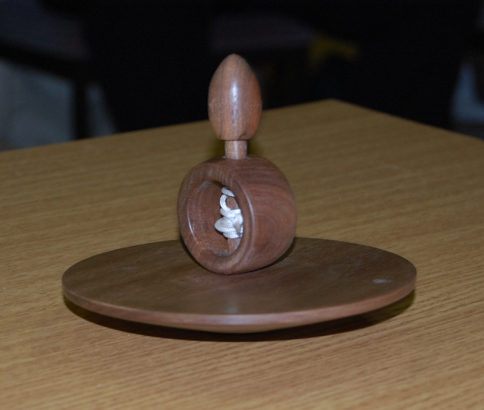 For the top, there are 3 parts to be turned, the spinning disc which is mounted on a shaft which passes through a ring. A length of cord is wrapped round the shaft and the ring is held in one hand when the cord is pulled by the other to spin the disc and shaft. Got it? Firstly the ring was turned from a 2” cube after drilling a 9 mm hole about 5/8” from one end. Mounted in a chuck from the other end with the 9mm hole across the axis, the exposed length was turned to a cylinder and a 1 ¾ ” hole was drilled to a depth of 1 ¼”. This was sanded and parted off to produce a ring with a 9 mm hole across it. To finish the parted off end, the ring was jammed on to a spigot cut on the scrap wood remaining in the chuck. 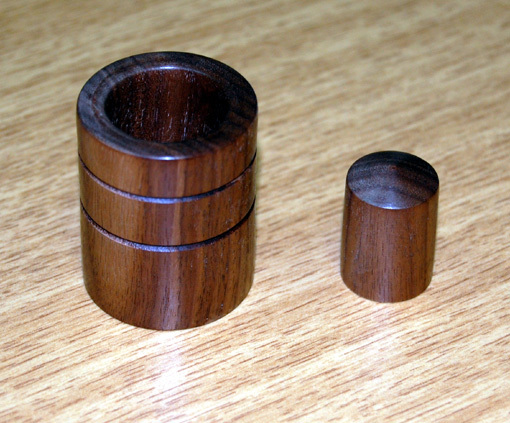 The shaft was turned to 8 mm diameter between centres with a knob at one end and not parted off. 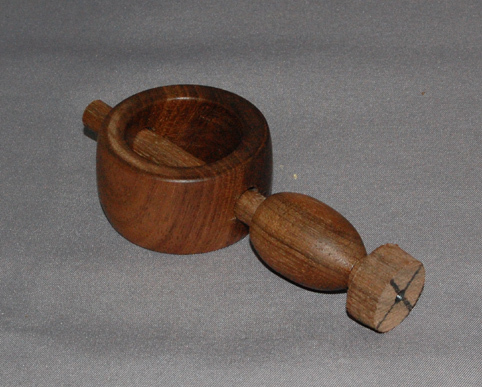 The knob can be any shape and Paul recommended making it oval or tear drop shape if you have trouble turning a ball. The disc was turned from a blank 5 ¼” square by 1 ¼”. This involved holding between centres to cut a temporary spigot on which the disc was mounted to turn the shallow conical bottom. The cone was decorated with rings and a disguised spigot for reversing. The centre of the cone was drilled to take a brass pin on which the top would spin. The disc was reversed and the top faced off and a centre hole drilled to take the shaft via a tight fit. The shaft end was glued and pressed in after first sliding it through the ring. The shaft was drilled where it sits in the middle of the ring to take the cord. The knob end was parted off and finished. The top was then tested by first rotating the shaft to wind up the cord. This was then pulled firmly whilst holding the ring. When the cord is fully out, letting it go allows it to re-wind and the top can be dropped onto a flat surface to spin for up to 2 minutes. Paul gave a quick critique of the gallery items. Thanks, Paul, for an entertaining evening. Perhaps we can look forward to some tops in the gallery in future and a spinning contest? Finally, thanks to all those who donated splendid turned items for PCaSO.